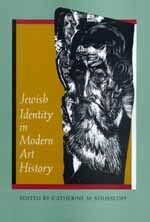 In the first comprehensive study of Jewish identity and its meaning for the history of art, eleven influential scholars illuminate the formative role of Jews as subjects of art historical discourse. At the same time, these essays introduce to art history an understanding of the place of cultural identity in the production of scholarship. Contributors explore the meaning of Jewishness to writers and artists alike through such topics as exile, iconoclasm, and anti-Semitism. Included are essays on Anselm Kiefer and Theodor Adorno; the effects of the Enlightenment; the rise of the nation-state; Nazi policies on art history; the criticism of Meyer Schapiro, Clement Greenberg, and Aby Warburg; the art of Judy Chicago, Eleanor Antin, and Morris Gottlieb; and Jewish patronage of German Expressionist art. Offering a new approach to the history of art in which the cultural identities of the makers and interpreters play a constitutive role, this collection begins an important and overdue dialogue that will have a significant impact on the fields of art history, Jewish studies, and cultural studies. Catherine M. Soussloff is Professor of Art History and Visual Culture at the University of California, Santa Cruz, and the author of The Absolute Artist: The Historiography of a Concept (1997). Pseudo Hecataeus, "On the Jews"